Please forward these instructions to your customers or recipients that you deliver goods or other valuables to using the Venipak quick delivery service. A courier serves other companies as well, therefore you are kindly requested to collect your consignments from the courier as fast as possible. Do not sign on P.O.D. (proof of shipment delivery) upon shipment until all the packages are checked. When receiving a consignment, please do not sign the P.O.D. before verifying whether the package has any signs of external damage. 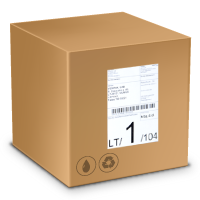 A pallet wrapped in packaging film is deemed equivalent to a single package. Do not open the package until you have signed the P.O.D. The courier is only responsible for the packaging, but not for the items inside the package. The party responsible for the contents of the package is the sender thereof, therefore, in case you identify the lack of any products or other valuables, please contact the company that has sent the consignment.